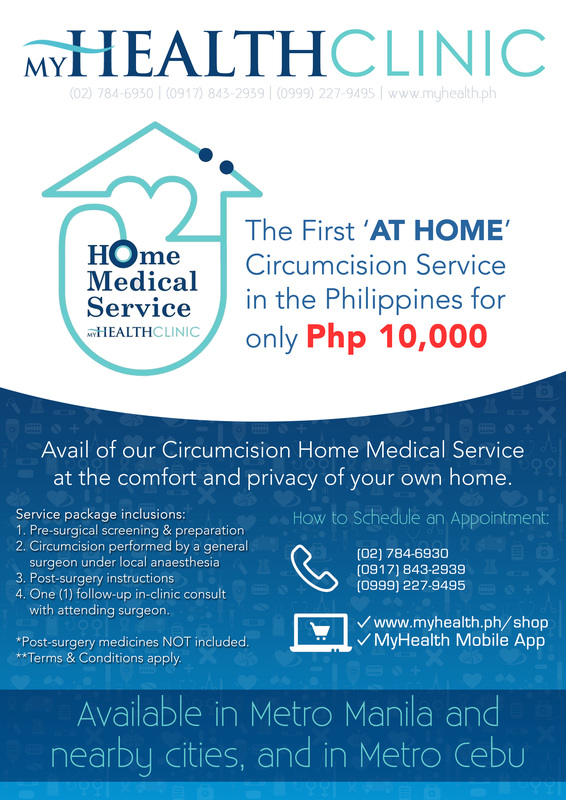 The first Home Circumcision Service in the Philippines is now available! Q: What would be the right age to perform circumcision? done between eight (8) to fourteen (14) years old. MyHealth Clinic accepts circumcision at any age, depending on the Surgeon’s assessment. Q: Who will perform the home service circumcision? A: Our home service medical team is composed of one (1) licensed surgeon, who will conduct the surgery, and one registered (1) nurse who will assist in the procedure. Q: Is it safe? What are the risks associated with circumcision? A: Complications like bleeding, infection, and ulceration may arise. MyHealth Clinic offers pre and post operative health teaching for both parents and patients who will undergo this procedure. circumcised. The surgeon will prescribe analgesics or medications to relieve pain. Q: What are the health benefits of having circumcision? Q: What are the inclusions of the home medical service circumcision? A: The home medical service circumcision already includes the Medical Team composed of 1 Surgeon and 1 Nurse, Mobilization Fee, Pre-screening Procedures (Counselling and Physical Exam), Anaesthesia, surgical equipment, and medical materials needed during the procedure, and one (1) free follow-up consult at the nearest MyHealth Clinic branch. Q: Is there anything that is not included in the package? A: Only post-procedure medications are not included in the package. A: There are three (3) ways to book an appointment: (1) Call our hotline (02) 784-6930 / (0917) 843-2939 / (0999) 227-9495 and then deposit the payment to MyHealth’s bank account; (2) Book through our website via www.myhealth.ph/shop and pay P10,000 using your debit or credit card; (3) Book through the MyHealth mobile app (search and download MyHealth Clinic in the Google Play Store) and pay P10,000 using your debit or credit card. Q: I live in Bulacan/Valenzuela/Laguna/Cavite. Can I book an appointment? Are there additional charges? A: Yes, you may book our home medical service as it covers Metro Manila, Metro Cebu, and the nearby areas. There may be additional charges depending on your exact home address. Please call our hotline to inquire further. Q: Is there a cheaper option to this package? A: MyHealth Clinic offers a summer circumcision promo of P3,000 every year, from March 1 to May 31 at all MyHealth Clinic branches. You may book an appointment by calling our hotline numbers, or by booking online through https://www.myhealth.ph/product/be-myman-circumcision/.